essa semana vamos começar a analisar as cartas do Deck Build Pack: Infinity Chasers Collection . Vamos ver as cartas do arquétipo Infinitrack! LETS GO! (1) If this card is Normal or Special Summoned: Add 1 “Infinitrack” monster from your Deck to your hand, except “Infinitrack Harvester”. (2) You can target 1 Machine monster you control, except this card; until the end of the turn, the Levels of this card and that target become the total of their combined original Levels. comentários: deck seacher. além disso reajusta levels. INTERESSANTE! Position, except “Infinite Igniton Rock Anchor”. comentários: auto-hand summon mas tem custo. além disso é um support (s/t) seacher. NICE! (1) You can Tribute 1 EARTH Machine you control; Special Summon this card from your hand in Defense Position. (2) You can banish this card from your GY, then target 1 Level 5 or lower “Infinitrack” monster in your GY, except “Infinitrack Trencher”; Special Summon that monster in Defese Position. (2) You can banish this card from your GY, then target 5 EARTH Machine monsters in your GY; shuffle those monster into the Deck, then draw 2 cards. You can only use the 1st and 3rd effects of this card’s name each once per turn. 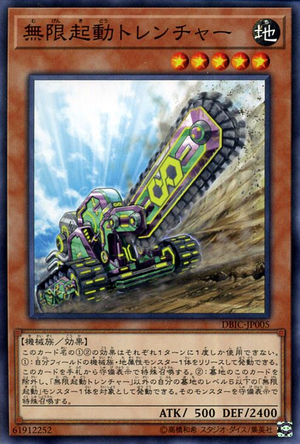 (1) You can detach 1 Xyz Material from this card; either add 1 EARTH Machine monster from your Deck to your hand, or send 1 EARTH Machine monster from your Deck to the GY. (2) When this card destroys an opponent’s monster by battle: You can attach that monster to this card as Xyz Material. 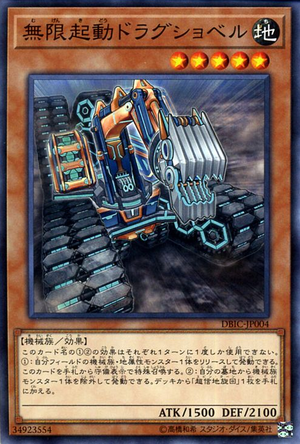 (3) If this card is in the GY: You can Tribute 1 Machine Link Monster; Special Summon this card in Defense Position. You can only use the 1st and 3rd effects of this card’s name once per turn. (1) You can detach 1 material from this card; this card gains 1000 ATK. (2) When this card destroys an opponent’s monster by battle: You can attach that monster to this card as material. (3) If this card is in your GY: You can Tribute 1 Machine Link Monster; Special Summon this card in Defense Position. If this card is sent from the field to the GY: You can target 1 Xyz Monster you control; attach this card to it as material. You can only use this effect of "Infinitrack Goliath" once per turn. 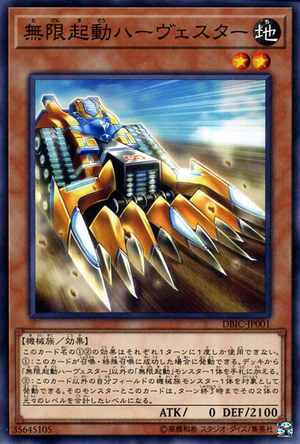 An Xyz Monster whose original Type is Machine and has this card as material gains this effect. ● Cannot be destroyed by card effects. comentários: L1 monstro com formula temática. se enviada pro cemitério , pode se tornar overlay unit num xyz monstro. enquanto overlay unit confere a habilidade extra de imunidade contra efeitos. (1) Machine Xyz Monsters you control cannot be targeted by an opponent’s card effect. (2) Once per turn: You can target 1 “Infinitrack” Xyz Monster you control; Special Summon from your Extra Deck 1 Machine Xyz Monster that is 2 Ranks higher than that monster you control by using it as the Xyz Material. (This Special Summon is treated as an Xyz Summon, also transfer the materials to the Summoned monster.) You cannot Special Summon monsters, except EARTH Machine monsters, for the rest of the turn after you activated this effect. 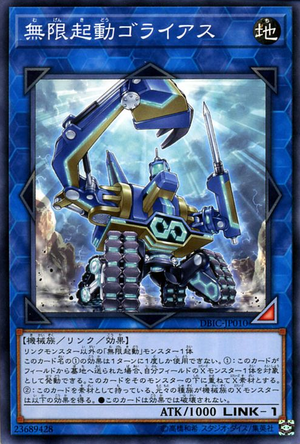 • Target 1 of your Attack Position EARTH Machine Xyz Monsters and 1 monster your opponent controls; change the battle position of your monster, and if you do, destroy that opponent’s monster. 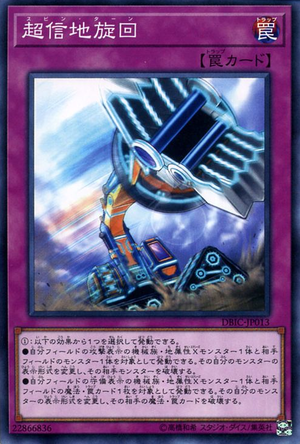 • Target 1 of your Defense Position EARTH Machine Xyz Monsters and 1 Spell/Trap your opponent controls; change the battle position of your monster, and if you do, destroy that opponent’s card. comentários: removal tool mas depende da presença de EARTH Machine Xyz Monster em campo. Infinite Ignition (Infinitrack) Combos and Deck Profile - All Machines Assemble! !